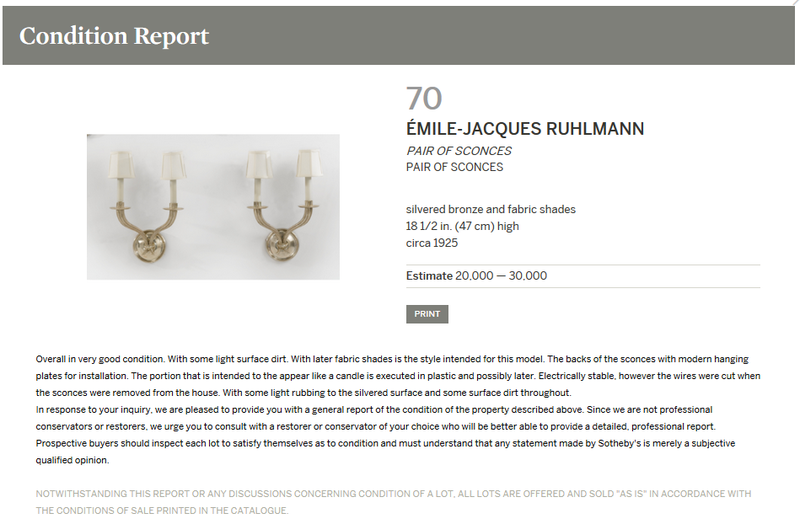 On March 10, 2011, the world-famous auction house SOTHEBY’S sold a pair of wall sconces wrongly assigned to Emile-Jacques Ruhlmann. We fixed this! SOTHEBY'S got pulled over by the PATROL! Same Scandal Strikes the Unsuspecting Twice in NYC! Ladies and gentlemen, the story you are about to read is true. Some names have been changed to protect the innocents. On a dismal Thursday evening in the ides of March, 2011, the hammer came down hard to everyone’s ignorant delight and approval at SOTHEBY’S hide-out in the Big Apple’s elegant auction district. “Sold!” Mr. X, the initial buyer and first victim, briskly walked away ecstatic over his winning bid of $35K (buyer’s premium included) for Lot 69 – a pair of 1925 bronze Art Deco wall sconces designed by the famous Emile-Jacques Ruhlmann. The drizzle and conceit thickened as he packed up his prize for a quick get-away, unaware of the grieve that would await him. Mere moments later, the second mark, Mrs. Y – whose identity has also been hidden to protect her from the truth – also succumbed to a similar fate. The exact same scenario, again, occurred within the reputed safety of SOTHEBY’S New York City auction house. Like other suckers before her, she fell for the ruse of a headline offering another coveted pair of Emile-Jacques Ruhlmann wall sconces – Lot 70, displayed in the auction catalog. (Exhibit 1 & 2, below.) The ill-fated dame shelled out $25,000 (buyer’s premium included) for her treasured lights. Sadly, she and her counterpart collector Mr. X might not even know, to this day, what hit ‘em. DOCANTIC patrols the market to make sure that 20th Century furniture, and works of art receive proper attribution, and accurate documentation, so that collectors may sell and/or purchase works at the correct price. Protect and serve the art community, that’s our job! Once the rain dried and the checks cleared, in actuality, the two victims each held in their possession a pair of sconces from circa 1952 designed by the lesser-known (although amazingly talented) Henri Delisle, and valued at less than $650! The switch had occurred right under everyone’s eyes. And the loss of their hard-earned stash on mere ornaments was unforgivable! One year later, June 2012, the PHILLIPS auction house attempted to reenact the same nefarious incident that occurred in SOTHEBY’S corridors with the exact same product: Mrs. Y’s Lot 70. (Exhibit 3.). But they bungled the job royal. Never at ease to just compare mug shot photos, our man in New York had to examine the proof for himself. 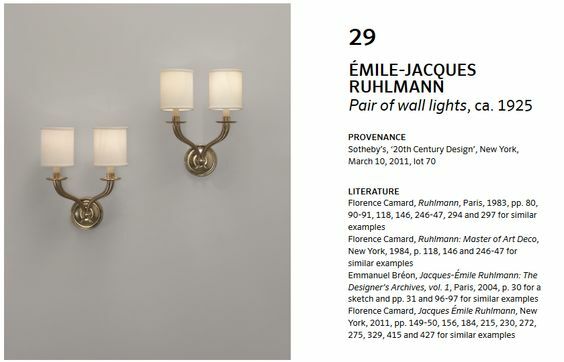 Going into the investigation, he painstakingly put his hands on an authentic pair of hard-to-find Emile-Jacques Ruhlmann sconces, whose photos PHILLIPS had only referenced (the infamous page 91 in Florence Camard’s 1983 book titled Ruhlmann)! He needed to be 100% sure of any errors. Then, the undercover agents sent this ‘unnamed’ & ‘undated’ bait (without the verified evidence) to 6 unsuspicious suspects, including alleged online art experts; and, to the crime scene itself, SOTHEBY’S. On one end of the alley, a couple joints assigned the ‘unnamed’ sconces only 20% of their actual value ($120). Lower than low! Our nitpicky investigators, had once again, compiled all the above documents and exhibits to bring the facts to light. The clouds parted and the sun began to shine again over 1334 York Avenue, NYC. Case closed. Whether he was in on the SOTHEBY’S take or not, the sconce seller made out like a bandit. In theory, he raked in almost 30 grand in profit. The auction house didn’t do too bad either on their commission. But pity the poor buyers, when they turned around to PHILLIPS to resell their prize. They got the surprise of their lives! 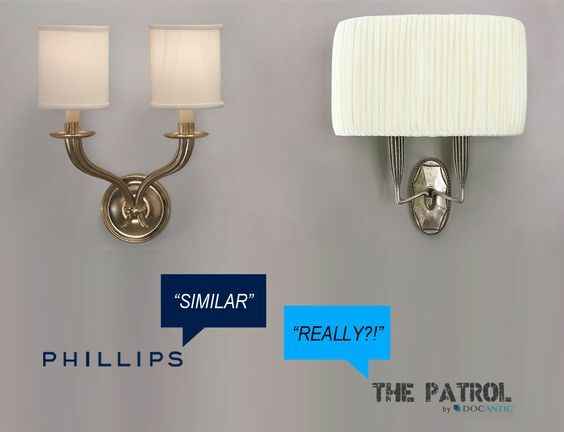 Overvalued sconces, busted. If it weren’t for DOCANTIC’s exhaustive archives of literature on 20th Century Furniture and Art, the truth would never had been known. Art appraisers, auction houses, dealers, collectors, buyers, sellers, and the uniformed press would just go on strolling down the street, whistling in blissful ignorance. But our gumshoes go patrol the dirty streets of the market to defend, serve and protect the art community. We dig up the proper attribution and accurate documentation, so collectors may sell and/or purchase works at the correct price. That’s our job! “It’s about the facts, m’am, just the facts.” Accurate identification and documentation will secure a trustworthy valuation! Not over- or under-priced. To protect the pieces you value, interrogate the gigantic DOCANTIC database. This is the city: Los Angeles, California. I work here. I’m Raymond Chandelier, the PATROL‘s Bounty Hunter. I eat art delinquents for lunch.